It is a well-known fact that Austrians got a sweet tooth, and like many typically Austrian things, this is most pronounced in Vienna. Think of all the tarts, cakes and chocolate - on fact, the Viennese are so crazy about candy, that they even built a church for Maltesers, the "Malteserkirche" in the Kärntnerstraße, half way between Stephansdom Cathedral and Staatsoper, the National Opera. Bad joke of the day - in fact, the Malteserkirche was built by and for the Maltese knight order, a rather successful party of crusaders who managed to conquer and plunder enough to build themselves all sorts of castles, palaces and churches throughout the Mediterranean and Central Europe. Before they acquired the island of Malta, the knight order was called "Johannites" or "Knight′s of St. John" - and it was one of the three most significant knight orders that had emerged from the crusades: The other two being the Knights Templar and the German Order, whose international headquarter you will find literally 300 metres away from the Malteserkirche in the Deutschordenshaus. There are written records that date back to 1217 that refer to a "house of the brothers of the order of Saint John" (note the German obsession with genitives, which I have tried to preserve in the English translation). From the sources that I have read, I am not sure whether this was the actual Johannites or just monks who cared for the sick and poor; the former possibility is supported by the fact that these mentioned brothers were in charge with acquiring supplies for navigation, hinting to the Mediterranean order. In any case, today′s Malteserkirche was built in the 15th century as a small church with a single, Gothic nave. With no dramatic changes, several small things about the Malteserkirche were altered in the following centuries. Only in the 19th century, some sad changes were made, most drastically the new façade of 1806, which gave the church its current tower. In 1839, the Johanneshof Court was built as the order′s house, which by then had given up crusading and become a religious order. At the same time, the neighbouring houses in Kärntnerstraße were built directly to the building. In 1857, the church got stained glass windows that are still there. After WWI, the Maltesers - now fully dedicated to health care and mission - were in financial difficulties and sold both Malteserkirche and Johanneshof. 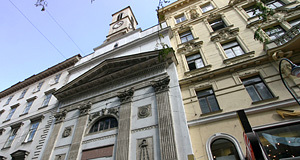 The church survived WWII (many other houses on Kärnterstraße didn′t) and in 1960, the order bought the building back with the financial aid of a benefactor. Today, it is situated at the centre of one of Austria′s busiest shopping lanes. The interior contains several interesting pieces of artwork; the altar painting from 1730, the Baroque organ, or mason work on the ceiling. The most elaborately decorated item after altar and organ, however, is the tomb of Jean Parisot de La Valette, who lived from 1557 to 1568. He successfully defended the island of Malta against the Turks. Malta′s capital La Valetta is named after him.